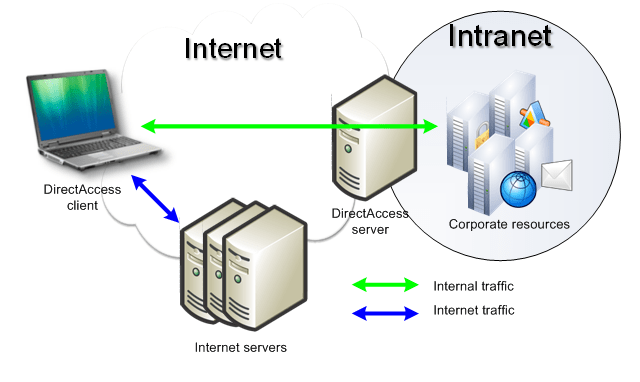 Microsoft DirectAccess technology provides seamless corporate network connectivity to the clients. Available in Windows 7 Enterprise (client) and Microsoft Server 2008 R2 (server). Implementation mostly relies of mandatory IPsec implementation in IPv6 protocol. For further reading see the list of relevant resources below. Part 1 – What is DirectAccess? Part 3 – Why use DirectAccess? This entry was posted on January 8, 2012 at 01:47	and is filed under Miscellaneous. Tagged: DirectAccess, Microsoft. You can follow any responses to this entry through the RSS 2.0 feed. You can leave a response, or trackback from your own site. More about DirectAccess from @vpnhaus: http://vpnhaus.ncp-e.com/2011/08/30/opinion-does-microsofts-directaccess-supersede-vpns/, http://vpnhaus.ncp-e.com/2012/01/10/directaccess-and-vpn-whos-hurting-who-part-1/, http://vpnhaus.ncp-e.com/2012/01/12/directaccess-and-vpn-whos-hurting-who-part-2/.